The rumors are true folks! Beginning in fall 2014, Canvas will be the official online platform of UCLA Extension. For those of you who already take online courses through UCLA Extension, you’ll be delighted by how much more user-friendly Canvas is over Extension’s previous online platform. And for those of you who up until now have been leery of online learning, trust me when I say that there’s never been a better time to give it a try. Canvas is easy to learn and easy to use. In fact, if you know the basics of getting around the internet, you’ll be maneuvering through Canvas with such ease that you may never return to the confines of a brick and mortar classroom. Canvas is web browser accessible and uses familiar, standard web navigation techniques. In other words, if you know the basic functions of surfing the net, you already possess the skills necessary to make your way around Canvas. And less time spent dealing with an unwieldy interface means more time to focus on your writing. Remember how Extension’s previous LMS forced you to click several buttons just to see the latest student post? Or how posts you already read still showed up as “unread”? With Canvas, all of those headaches are in the past. The peer feedback link on your sidebar lets you avoid having to click on numerous buttons just to go back to that one comment you saw earlier. And, with an email-style format, you don’t have to leave Canvas in order to send comments or messages to your instructor or your classmates. Ever log onto Blackboard, eager to see what your classmates or teacher said about your latest pages, only to be disappointed to find there aren’t any new comments? With Canvas, you can adjust the settings so you’re immediately notified, by your choice of text or email, about any new activity that relates to you. It’s brilliant really, for a media-junky like me, or for any student who simply wants to be kept in the loop. But don’t worry. If you’re one of those people who enjoy the element of surprise, Canvas gives you the option of turning off all notifications so you’ll never be bothered by unwanted clicks or dings. Wait, what?? For those procrastinators among you, Canvas has a calendar to notify you of upcoming deadlines and due dates. You can even link the calendar to your Google, Outlook, and/or iCal calendar feed. Create multiple personal calendars and consolidate them into a single viewable format. If you’re an overachiever who’s balancing more than one class, this nifty little feature is certain to come in handy. With the latest iPhone 6/6 Plus release, some of you are no doubt wondering if Canvas ismobile-friendly. Yes it is! Canvas is fully accessible on your iPhone, iPad, iPod Touch, Android, Palm, and Blackberry. And while you might be hard-pressed to pound out your novel or TV pilot on your cell, imagine how convenient it will be to respond to your instructors’ and classmates’ posts while waiting in that 6-people-deep line at Starbucks. Now, as simple as Canvas is, we realize there will still be a learning curve no matter how much online learning you’ve done in the past. Don’t panic, because Extension has your back. Check out the Canvas student portal that includes videos on how to navigate through your course, workshop with other students, and prepare for class. Need more convincing? Then click here to browse through some Canvas video tutorials. 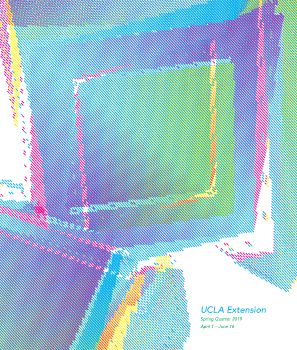 If you still have questions, you can always contact us at 310-825-9414 or landscapearchitecture@uclaextension.edu. We’re happy to help make your transition to Canvas as seamless as possible. – written by Phoebe Lim, the Program Assistant for Creative Writing (Online) and Events. Early Bird Enrollment for Fall Quarter ends soon!